There's no better thing to pair with a grilled cheese sandwich than tomato soup. I'm not exactly sure how it came to be but it doesn't matter. It's good and it's what's for dinner! Because I paired this soup with my 'Ultimate Grilled Cheese Sandwich', I knew the soup had to be healthier. 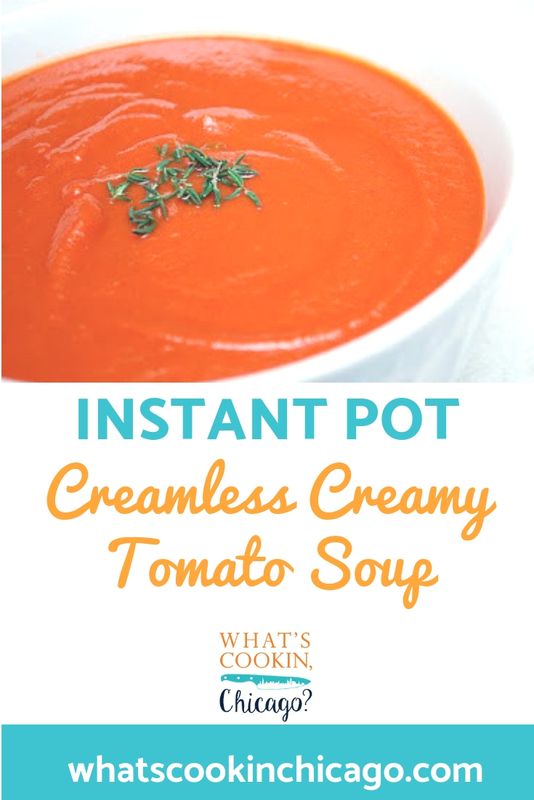 Traditional tomato soups usually include the addition of cream but for a healthier alternative without the extra fat and calories, I used bread in place of cream. The bread in the following recipe breaks down and is pureed, resulting in a creamy texture. I came across this recipe on my online Cook's Illustrated subscription and I love that it was so easy to make. I halved the original recipe so it serves 3-4 with enough for leftovers. This is another recipe great to make in advance and freeze. Sometimes there are those nights where we could enjoy a grilled cheese sandwich and this soup is better than the stuff in the can... and healthier too! Prep your sandwich bread by removing the crusts and cubed into bite sized pieces. Press SAUTE and add oil. When hot, add onion, garlic, red pepper flakes (if using), and bay leaf. Cook while stirring frequently, until onion is translucent, about 3 to 5 minutes. Stir in the crushed tomatoes, chicken stock, brown sugar and bread. Season to taste with salt and pepper. Serve soup in individual bowls. Sprinkle each portion with pepper, thyme leaves and drizzle with a garnish of olive oil if desired.